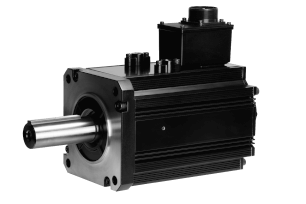 Accurax G5 servo motorlar, IP67 koruma ve motor gövdesinde konnektörler içerir. 10 kutuplu motorların ve 20 bit enkoderin kullanılması, motor hatalarında % 40 azalma sağlar. Servo motorlar, patentli yeni stator dizaynı PAC-Clamp, % 40 demir kaybı azaltma ve % 15 daha küçük enkoder nedeniyle % 25 daha hafiftir ve % 15 daha küçüktür. ① Select motor from R88M-K or R88M-KH families using motor tables in next pages. 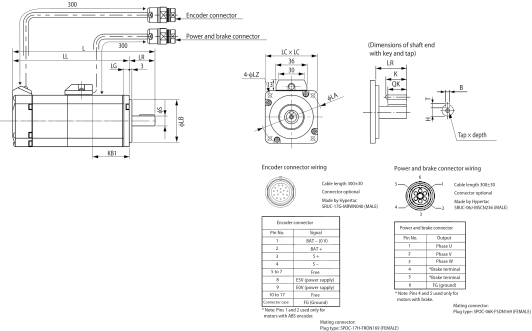 ② Refer to Accurax G5 servo drive section for detailed drive specifications and selection of drive accessories. Note:For servomotors fitted with an absolute encoder you have to add the extension battery cable R88A-CRGD0R3C_ (see below) or connect a backup battery in the CN1 I/O connector. All cables listed are flexible and shielded (except the R88A-CAKA___-BR-E which is only a flexible cable). 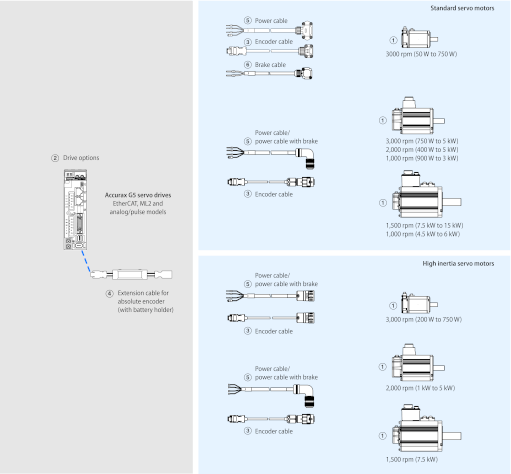 All connectors and cables listed have IP67 class (except R88A-CNW01R connector and R88A-CRGD0R3C cable).